M-eating seems to be a play on the word “meeting” and eating. The restaurant is indeed a place you’d want to meet up with friends to enjoy some good eating. It’s located at 10 Kalogera Street, in the heart of Mykonos Town. I dined there on a Thursday evening on the balcony facing the busy, labyrinth of a street. It provided for great people watching while dining on great food. 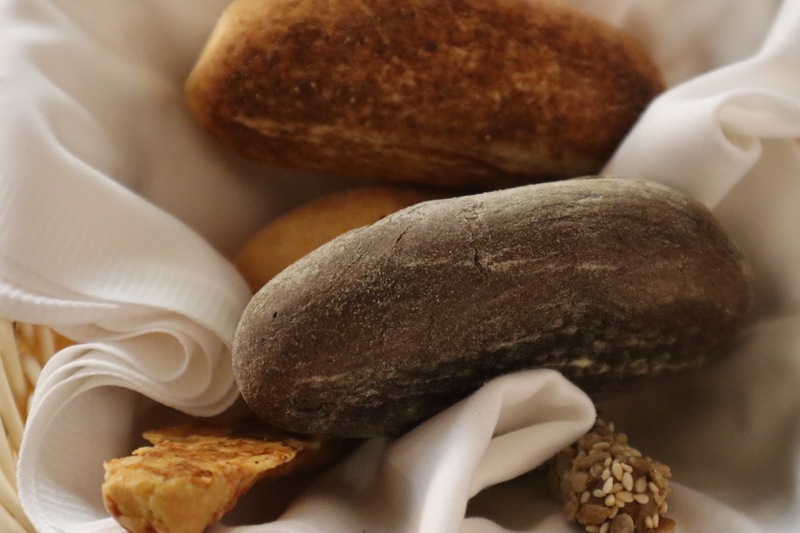 We started with the bread basket that contained a variety of breads. 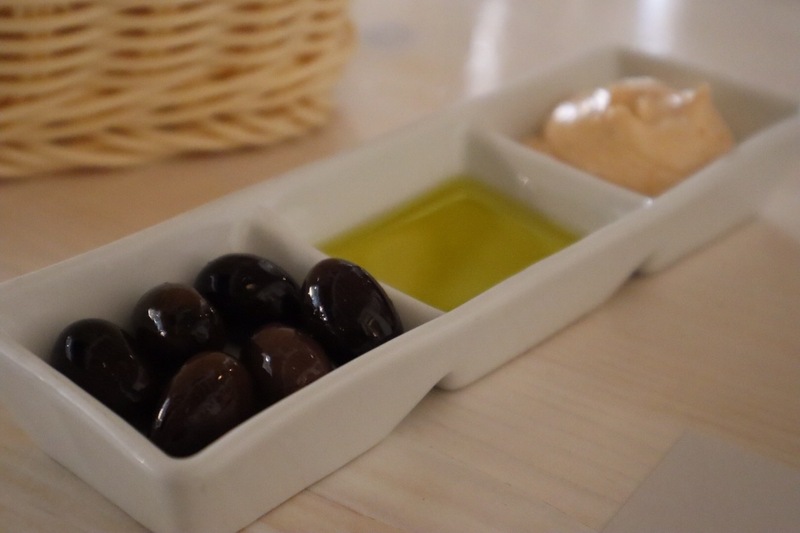 A yoghurt and sun-dried tomato pesto, an olive oil with lemon sauce and olives accompanied the bread basket. 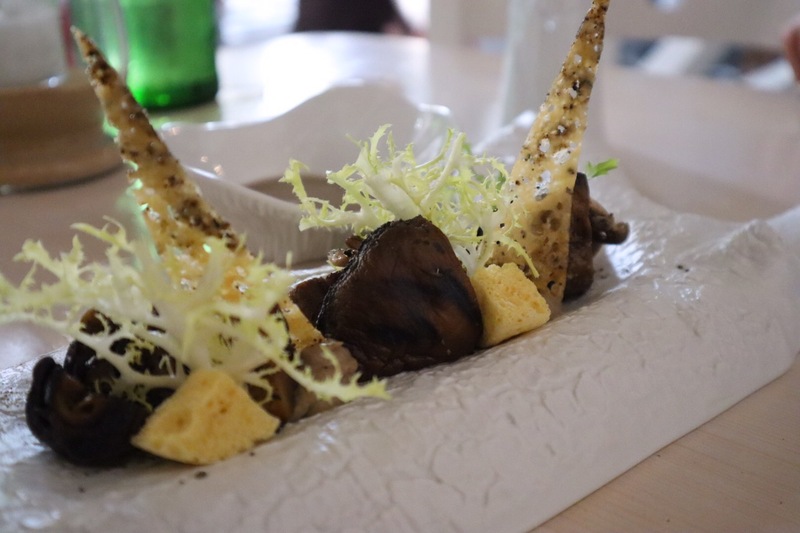 To start, we tried the “four Types of mushrooms in different textures”. The mushrooms came out accompanied by a cream of mushroom dipping sauce and chunks of parmesan cheese. As you can see, Chef Panayotis Menardos raises food preparation to an art form – — creating sculpture out of his dishes. Though the mushroom varieties were not listed on the menu, there appeared to be some shitake and portobello mushrooms in the mix. The dish was a great light way to whet your appetite while waiting for the main course. For the main dishes, you may want to try the Sea Bass. It came filleted, curled and placed on its side. Mashed potatoes accompanied the fish — along with a few green peas for decoration. The sea bass was placed atop a green pea puree, which added vivid color to the plate. 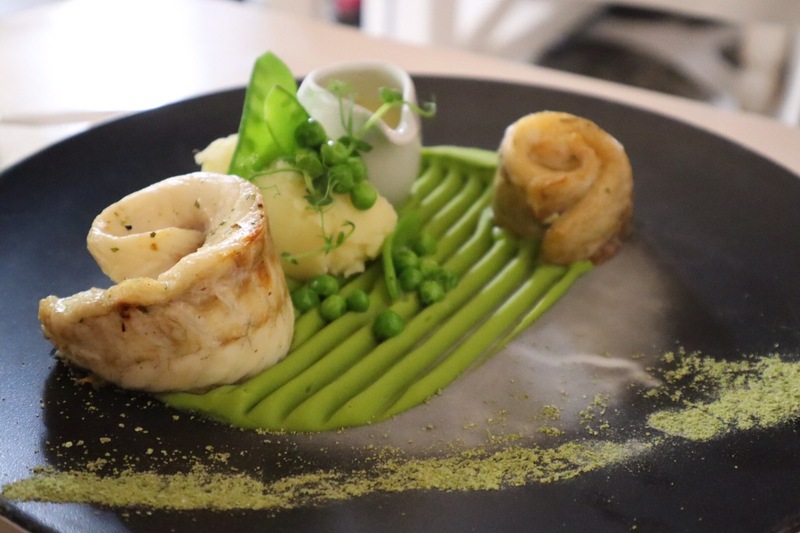 The fish was cooked to a perfect temperature; the pea puree was creamy with a velvety texture. This chicken fillet is prepared with the sous vide method. In French, sous vide means “under vacuum”. In this method, food is vacuum-sealed in a bag. Then, it is cooked in a water bath at a precise temperature, typically from one to seven hours. This cooking method produces the chef’s exact level of doneness. You might also want to try the Chicken Fillet prepared with the Sous Vide method. The chicken came stuffed with a delicious sun-dried tomato paste. Roasted potatoes with a bouquet of string beans served as side dishes. M-Eating’s chicken dish was also served atop green pea puree. The chicken was plump, tender and moist — and the sun-dried tomato paste provided a new twist on what could have otherwise been just your standard chicken breast. A walnut pie served as dessert, on its own “dust” of shredded walnuts. 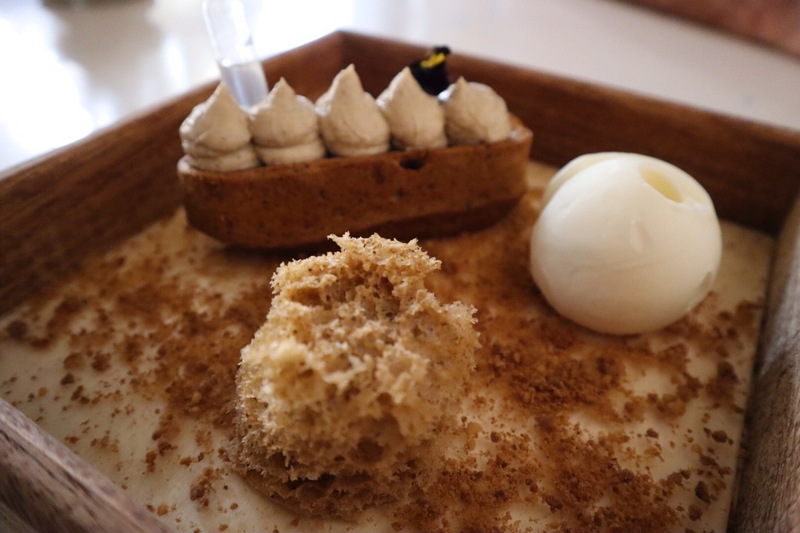 It came served with a small, airy piece of sponge cake and a ball of white chocolate ice cream. It was simply sweet and delicious. 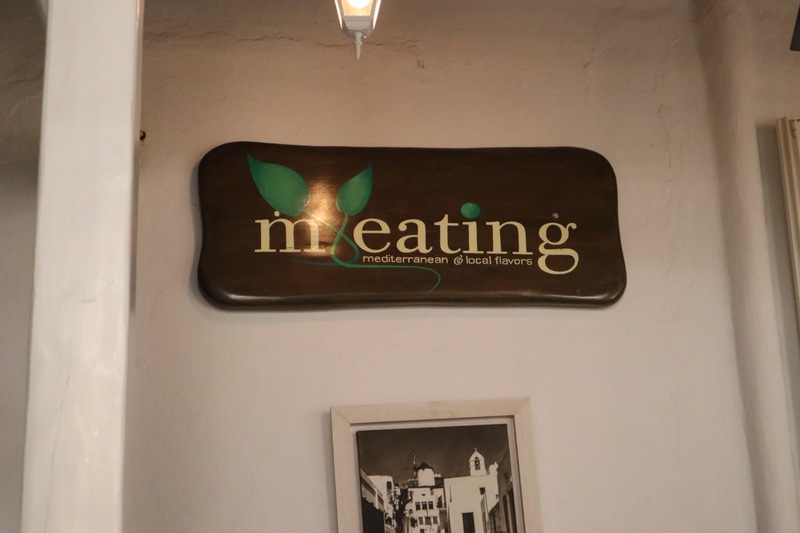 It’s easy to see why (as of this writing) M-eating is rated number 6 out of 246 restaurants in Mykonos, Greece on Trip Advisor. When I left, the lovely hostess, Sofia, looked at me and asked how I enjoyed the meal. Trying to use my limited Greek, I summed it up in one word: Fovero (“awesome” in Greek!). For a sensational dining experience in the nearby Cyclade Island of Santorini, check out The Sphinx Wine Restaurant. 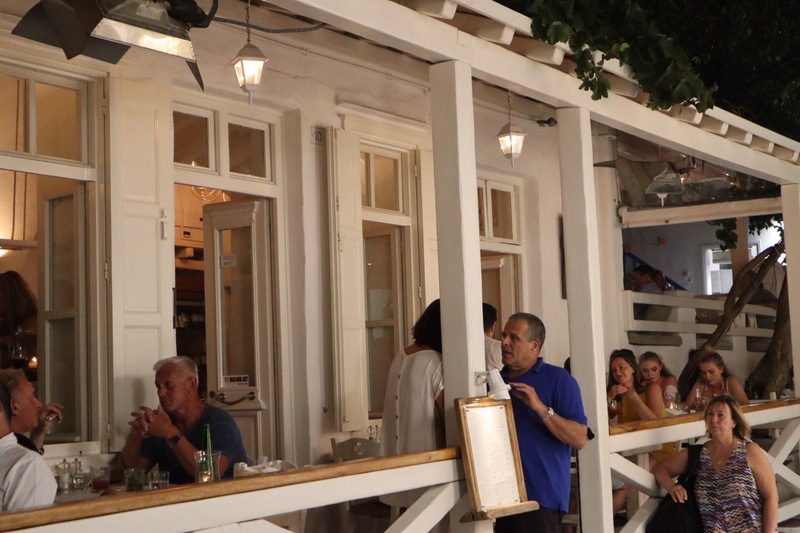 ← The Sphinx Wine Restaurant, Oia, Santorini, Greece: The Lowdown!